Regular readers will know that I do post about signage and health and safety from time to time, usually to do with schools. This post is nothing to do with education though. 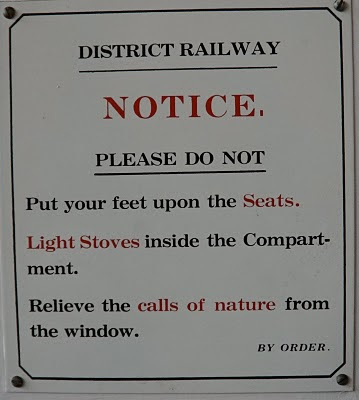 Imagine a sign trying to say anything about these topics today, procedures, policies, health and safety warnings, penalties, phone numbers and on and on and on.... It obviously just used to be so simple....... before the world went mad. I wasn't the only one who smiled - in the short while I was there two people, (one who I had never met before) asked me to email the photo to them. We obviously all agreed and was certainly one way to get talking to new people!